On the right is a selection of Liquorice Allsorts, a product where choice is a key feature. Everyone has their favorite, but there is something wonderful about finding it amongst the others. 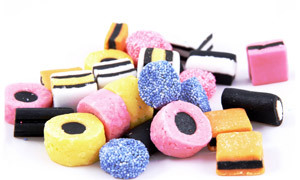 People share a bag of Liquorice Allsorts, and different people have different favorites. The variety keeps things interesting and leads to the consumption of far too much candy. Phones are not like Liquorice Allsorts. You don’t buy a bag of them and use a different one each day. Typically, you buy one phone and then use it for a long time. You don’t buy a phone and share it among a group of people. Typically, you are the only person who uses your phone. “Choice” is not a feature of a phone. Choice can be a feature of a category of phones (e.g. Android phones), but you don’t use a category of phones. You use a single phone. So when Microsoft and Google say that they offer consumers “choice”, they are either misunderstanding consumers or misrepresenting their reasons for providing choice. To be sure, there are some good reasons to offer choice. Choice increases your addressable market. One could make a strong argument that iOS and Android will start tapping out the addressable market for phones with an iPhone like form factor. There are people that would prefer a physical keyboard, for example, and when the only new market left is these people, then Android will benefit from that. Choice increases your distribution opportunities. If your strategy is to provide an OS and partner with many different OEMs or Mobile Operators, then supporting many permutations will help you. You can use some permutations to create unique offers with certain partners. And you can accommodate their varying points of view on what features are necessary to win. Even Apple with its vertical strategy could get more distribution if they offered more choice. Choice reduces the clarity of your message: It is hard enough to get people to understand a complex consumer electronics product without explaining a bunch of permutations. Apple understands this and is fanatical about keeping its product line simple. One form factor, one input method, one screen size, one app store, one OS release for all devices. It took incredible discipline to keep things this way. Choice compromises user experience: Supporting a physical keyboard on iOS would require the experience to be rebuilt from the foundations up, and the result would probably never reach the quality of the current iOS with its focus on the touch screen. UX design is a constant trade off between simplicity and the desire to add features. That is why, even with the worked example of the first TiVo UI, no company, not even TiVo themselves, could build as delightful a DVR experience. Supporting choice means creating products where the ratio of total features to features actually used is larger. In other words, more complexity without more value from the perspective of an individual user. Choice increases hardware costs (and risk): The fewer components you have in your product line, the better. It is easier and cheaper to manage your inventory. And more importantly, fewer distinct components spread over the same product volume gives you more leverage when negotiating prices with key component suppliers. Apple has even taken this to a point where they can lock up world supply for a particular component. This is called buyer power. Without it, you will pay more. Choice increases software costs (and risk): Building something with 3 options is much more than 3 times as hard as building something with one option. Every option that is added to a product contributes to a geometric increase in the complexity of the code base. This is completely lost on most product managers as they complain “how hard can it be to add that ONE additional checkbox!?”. Not hard, but once it is there it will be a gift that keeps on giving as it influences and constrains the rest of the system. Immediately, but also for years to come as the product evolves. Choice is a productivity sink: More meetings. More email. More hallway discussions. More support requests. Every little permutation that gets added to a product has an impact on managers, engineers, marketing, support and almost everyone else in the organization. Viewing each person’s activity as doing, the actual creating of value (designing a feature, writing ad copy) and coordinating, talking to other people about what you should do or how you should do it, each new option you add reduces the ratio of doing to coordinating. It can get so pathological that not only do management roles become 99% coordination, but the organization needs new, non-management roles held by smart, creative people that do nothing but coordinate. There is another effect that has been documented, but is less definitive. It seems that having more options can undermine our ability to make a decision. Sheena Iyengar’s research (which I found via John Gruber’s Daring Fireball, and which was the spark that lead me to writing this post) included an experiment where people were six times more likely to buy a jar of jam if there were 6 options than if there were 24 options. I experienced this myself when I had to buy an Android phone for testing our app. After reading countless reviews and visiting several stores I was stumped and ended up putting off the decision for a couple of months. I was finally forced to pull the trigger when we were running out of time, so I closed my eyes and clicked “add to cart” for the Google Nexus. The difference between this and the decision process when choosing an iPhone couldn’t be more stark. My list of “choice” cons is not exhaustive, but I think it will be sufficient to make the point that building choice is very costly. And since choice doesn’t have any material value for the user after they have purchased their new phone, it should only be built if the addressable market and distribution needs justify the investment. Is this the case for the two main proponents of smartphone choice, Google and Microsoft? Google, yes. Relative to Apple, user experience is lower in their stack of priorities (this isn’t a criticism, merely a necessity of their horizontal strategy), so they can stomach the UX cost more easily than Apple would. Their volumes depend on serving many, many partners (both OEMs and mobile operators), so pushing distribution as far as they can is important. And they have enough market share that they probably should be at least thinking about what happens when the addressable market gets more tight. Microsoft, no. With less than 2% market share, Windows Phone is nowhere near the point that addressable market or distribution reach are limitations. And the fidelity of the OS experience suggests that UX is high on their list of priorities. So as a Microsoft shareholder and a fan of Metro, I would love the company to concentrate on one, small part of the market and win there convincingly. The consumers they target won’t care one bit about choice, only that there is this one phone that excites them way more than any other. Before Windows Phone has this sort of localized traction, any effort on increasing the addressable market or opening more distribution channels will not only be wasted, but it will take resources away from the goal of winning in at least one corner of the market. Which brings me back to my starting point. Phones are not like Liquorice Allsorts. Choice is not a feature. It only has real meaning from a supplier’s perspective. It can give Google or Apple or Microsoft more addressable market or more distribution reach. Demand side value, however, is about millions of individual consumers, where all that matters is meeting each of their individual needs. And all that takes, in each individual case, is one great phone.